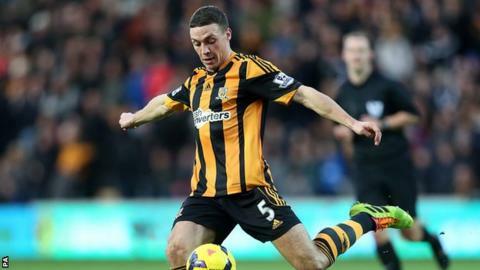 Hull City manager Steve Bruce says defender James Chester will not be available to make his Wales debut this summer even if he is fit for the FA Cup final. The 25-year-old is a doubt for the final against Arsenal because of a hamstring injury and Bruce wants him to rest in the close season. Chester has committed to Wales, who face the Netherlands on 4 June. "He won't be playing international football this summer," Bruce said. "That's for certain, even if he is eligible for the cup final next week." Warrington-born Chester, whose mother was born in Rhyl, has pledged his international future to Wales. Chester, who joined Hull from Manchester United in 2011, has been a regular in the Premier League this season. "They've been in dialogue with Chris Coleman, the Wales manager, and James has decided [to represent Wales]," Bruce added. "It's a big, important summer for Chessy. He had a horrific injury against Newcastle last September, one where he badly tore his hamstring. "Unfortunately he's had recurrences of that twice this year. I don't think he'll be playing any games this summer."